I love making these cute little owls! They are so cute that I can't help but keep making more and more. Each time I try a new color combo they just get better and better. I made a few bears, monsters, giraffe and a few more creatures but the owls might be my favorite. I am normally a small project crocheter. I like to be able to start something and get it done right away. I made a few afghans while I was pregnant with my little man but that was it for big projects. Otherwise I get board and have a lot of UFO's laying around that I end up undoing or getting rid of. This blog is an attempt to make that change. I just started following The Creative Crochet Crew on facebook and have fallen in love with it! 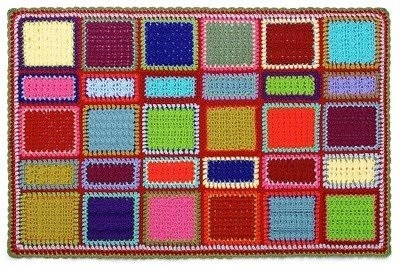 There is so much inspiration and great crochet blogs to follow. I love this afghan it seems like it would be a great remnant yarn project. And since I can't bring myself to throw out and scrap yarn balls this will be my next project for those odd balls of yarn I don't know what to do with. These dresses are BEAUTIFUL! I would love to make them both. And the pineapple shawl, so pretty! I will have to get some really nice yarn for that project. I have never done a pineapple stitch. It makes me a little nervous. But it is so pretty I have to try it. My Hubby has made a request for a bobble blanket of his own. One of the afghans I made for my baby was a bobble blanket, and my husband loved it . He wants the bobbles to be different colors like the one above found on this cute blog. Ahhh so many projects so little time. Looks like my fingers will be busy.